Your body is 1/1000th taurine, a chemical essential to life. The amino acid taurine is crucial for vision. It supports function of the heart, skeletal muscle, and the central nervous system. The pancreas produces taurine, and taurine is a major component of digestive bile. The chemical can be ingested from meats, fish and supplements, such as pills and energy drinks. In the 1970s, experiments on animals deprived of taurine found they did not develop proper vision. Since then, significant research has been conducted into taurine’s role in the development and maintenance of vision. Retinal ganglion cell (RGC) degeneration is a common reason for vision loss from diseases such as glaucoma. A study in 2012 found that taurine protected against the death of retinal nerve ganglion cells, both in the laboratory and in animals. The researchers expect drugs in the future to target taurine for neuroprotection. Taurine is an antioxidant, which is important to preventing age-related vision loss such as macular degeneration and other retinal diseases. Taurine also helps the retina eliminate waste. But, taurine levels in the retina decline a great deal as we age. Taurine deficiency is mostly a concern as a drug side effect, for diabetics and for the elderly. A study found that supplementing with taurine has reduced the effects of diabetic retinopathy. Even a high-meat diet does not seem to have much of an effect on taurine levels. Therefore, taurine supplementation may be needed in these groups to maintain eye health over a lifetime. Certain drugs deplete the body of taurine, risking retinal damage. The anti-epileptic drug vigabatrin (Sabril®) rocked the medical profession by damaging retinas through taurine deprivation. Chemotherapy drugs such as cyclophosphamide (Cytoxan®) and busulfan (Busulfex®) and radiation therapy can also deplete taurine levels. Supplementation in these cases can restore taurine levels to normal, providing retinal protection. Next: Learn more about nutritional support updates for the macula. Huxtable, RJ (1992). 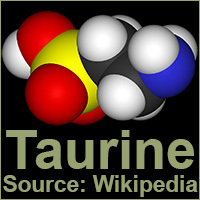 “Physiological actions of taurine”. Physiol Rev 72 (1): 101–63. PMID 1731369. Taurine provides neuroprotection against retinal ganglion cell degeneration by Froger N et. al. PLoS One. 2012;7(10):e42017. doi: 10.1371/journal.pone.0042017. Epub 2012 Oct 24.